Please note: Inventory changes daily thus we cannot promise that a particular plant will be in stock when you arrive to shop. Because of the labor involved and fairness to other shoppers, we cannot pull inventory or hold plants for pick up. Uses A classic addition to foundation plantings and mixed borders. Features Reblooming lilac blooms from spring and again from mid-summer to frost. Small habit fits into any garden. Good for cutting. Fragrant. Deer resistant. Uses It's great for perennial gardens and container gardens. 'Blue Chip' also makes a fantastic mass planting. Features Dwarf. Non-invasive. Reblooms without deadheading. Fragrant flowers. Deer resistant. Attracts butterflies and hummingbirds. Soil Best in well-drained soils. Pruning Generally not needed, but may be trimmed in spring. Reblooms until frost without deadheading. Attracts hummingbirds. Pruning Prune to shape after flowering. Uses Grouped or in mass plantings, mixed borders, containers, specimen plant. Flowers in spring and again in summer and fall. Evergreen. Disease resistant. Soil Prefers fertile, well-drained soils. Soil Prefers moist, deep, well-drained soils. Pruning Prune minimally in spring, no more than 3' from the base. Uses Mixed borders, foundation plantings. Features Yellow flowers. Reblooms. Deer-resistant. Soil Prefers moist, well-drained soils. Features Dwarf, low mounding golden barberry with red fall color. . Soil Prefers well drained soils. Pruning Little needed. May be shaped in summer. Flowers attract butterflies and hummingbirds. Compact. Fragrant and deer resistant. Attracts butterflies and hummingbirds. Fragrant. Deer resistant. Pruning Seldom needed, but may be shaped in summer if necessary. Features Variegated evergreen foliage. Deer resistant. Very hardy. Features Native. White flowers. Fragrant. Red fruit. Dwarf. Soil Best in moist soils. Features Huge flowers. Thornless. Good for cut branches - may be forced in winter. Deer-resistant. Uses Shrub borders, hedges, specimen, perennial borders and containers. Features Evergreen with soft, bright green leaves flecked silver blue underneath. Compact. Elegant soft texture. Deer resistant. Features Variegated foliage. White flowers. Deer-resistant. Soil Best in moist, well-drained soil. Features White spring flowers. A traditional favorite for beds and borders. Easy to grow. Features Bright yellow early spring flowers. Dwarf habit. Outstanding flower display. Deer resistant. Features Electric yellow flowers in late spring. Great en masse for the spring garden. Excellent texture. Deer resistant. Drought and heat tolerant. Soil Prefers well-drained soils. Needs good drainage. Features Reblooming hydrangea with pink or blue flowers. Pruning Generally not needed, but may be trimmed immediately after the early summer bloom. Features Large pink or blue summer flowers. Rebloomer. Pruning Prune after early summer flowering. Uses Great landscape plant adds a dash of bright color to the garden. Good in groupings or masses, in a perennial or shrub borders, as a specimen, screen or hedge. Use in mixed containers, containers, and as a cut flower. Plant in the ground for the winter. Features Large, vividly colored mophead flowers in summer. Reblooming. Blooms every year. Soil pH affects flower color. Good fall color. Soil Prefers moist, well drained soils. Features Pink or blue summer flowers. Rebloomer. Uses Great landscape plant adds a dash of bright color. Good in groupings or masses, in a perennial or shrub borders, as a specimen, screen or hedge. Use in mixed containers and transplant into the ground in fall. Features Large pink summer flowers change to green with age. Compact. Disease resistant. Soil pH will affect bloom color. Soil Prefers moist, well drained soils. May need winter protection in northern climates. Uses Compact variety does very well in both containers and landscapes. May be used in mixed borders and perennial gardens. If grown in a container it should be planted in the ground in fall. Features A small plant with showy magenta and white summer flowers. Long lasting flowers. Mildew resistant. Soil pH affects bloom color. Uses A dramatic centerpiece for mixed container designs. Also great for mixed borders and perennial gardens. Features Small to medium sized early blooming hydrangea with large, longlasting flowers. Mildew resistant. Flower color is affected by soil pH. Compact. Uses Great landscape plant adds a dash of bright color. Good in groupings or masses, in a perennial or shrub borders, as a specimen, screen or hedge. Use in mixed containers, containers, and as a cut flower. Features Big hot pink summer flowers change to green with age. Compact. Disease resistant. Soil pH will affect bloom color. Uses An excellent summer color item for the mixed border. The distinctive black stems add interest even when the plant is not in bloom. Features Vivid mop-head flowers perch atop black satin stems in summer. Flowers emerge green and peach, then mature to hot pink. Flower color affected by soil pH. Good for cutting. Unusual black stems. Uses Excellent for mixed borders and cutting gardens. Features Large, distinctive summer flowers. Good cut flower. Glossy foliage. Bloom color is affected by soil pH. Uses Excellent as part of mixed borders, or as a foundation plant. It can also be a showy specimen plant, or grown in a container. Features Abundant white summer flowers. Blooms every year. Hardy. Soil pH does not affect bloom color. Soil Adaptable to most well-drained soils. Bloom color is not affected by soil pH. Pruning Prune back in late winter/early spring. Features Native. White flowers. Burgundy fall foliage. Uses Landscapes, naturalizing, perennial gardens. Also makes a very dramatic cut flower. Features Massive flowers bloom in summer, and are held up by very sturdy stems. Very hardy and reliable. Good for cut flowers. Native. Soil Adaptable to most well drained soils. Pruning Prune to shape in late winter/early spring. Uses Pink summer flowers add rich color to summer landscapes. Excellent native plant for mixed borders or perennial gardens. Features Rich pink flowers bloom from early summer to frost. Dark pink buds open to hot pink flowers which then turn soft pink as they mature, finally changing to green at the end of their life cycle. Very hardy. Reliable bloomer. Native. Uses Good in groupings and masses, in perennial and shrub borders, as a specimen, screen, or hedge. Good in containers, mixed containers, and as a cut flower. 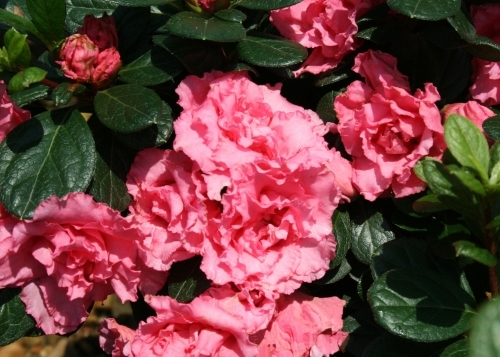 Features Reliable, soft green summer flowers change to pink in fall. Great for cuts. Blooms every year. Soil pH does not affect bloom color. Uses Excellent for the mixed border or foundation plantings. 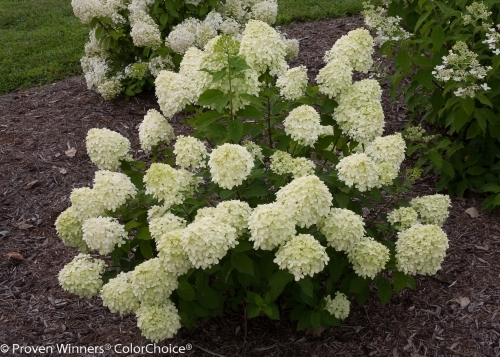 This compact, hardy hydrangea fits easily into smaller landscapes. 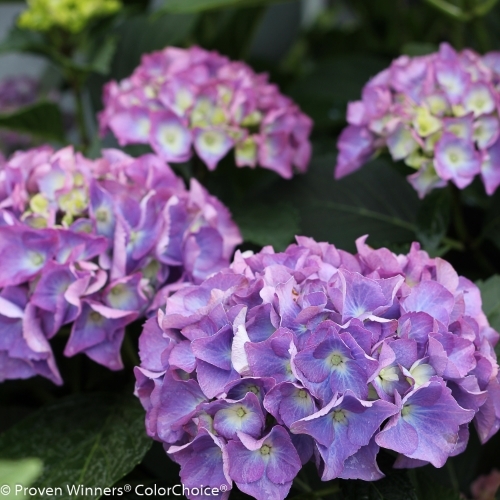 Features Dwarf hydrangea produces green summer flowers that turn pink in fall. Dwarf 'Limelight'. Blooms every year. Hardy. Uses An outstanding specimen plant or element in the mixed border. It can also be grown in the cutting garden. Features Large summer flowers open white and change to pink. Blooms every year. Hardy. Soil pH does not affect bloom color. Uses Mixed borders; foundation plantings. Features Very hardy reblooming hydrangea. Lacy pink or blueflowers. Soil Prefers moist, well drained soils. Flower color is affected by soil pH. Uses Late season color for hedges, perennial or shrub borders, specimen plantings. This is a nice addition to the mixed border. Features Large blue flowers in late summer. Adaptable and easy to grow. Deer resistant. Attracts butterflies. Features Lavender flowers in late summer. Adaptable and easy to grow. Deer resistant. Attracts butterflies. Features Large, lacy pink summer flowers. Adaptable and easy to grow. Deer resistant. Attracts butterflies. Uses Great large shrub for landscape use, young plants can be used in containers but will need to be moved to the landscape as they mature. Can be trained into a small tree. This is an excellent plant for the mixed border or as a specimen plant. Features Large, pure white summer flowers. Adaptable and easy to grow. Deer resistant. Attracts butterflies. Uses Use as the centerpiece of large container designs or incorporate into mixed borders in the landscape. Good for hedging. Features Rich blue summer flowers add unique color to the garden. Deer resistant. Attracts hummingbirds. Seedless. Uses An excellent hardy hibiscus for the landscape. Can be trained into a small tree. Excellent for use in mixed containers and then removed for fall planting. Good for hedging. Uses Late season color, hedges or screens, perennial or shrub borders, specimen and containers. May be planted in a container as a patio plant and then transplanted into the ground in fall. Features Variegated foliage is attractive all season, and soft pink blooms in summer. Deer resistant. Attracts butterflies. Non-invasive. Uses Groupings, masses, perennial or shrub borders, hedges. Great for adding bright summer color to the garden. Features Bright yellow flowers from July to September. Long bloom time. Deer resistant. Native. Soil Best in moist, well drained soils. Pruning Prune to shape in spring. Features Native. Red fall fruit. Good for cuts. Compact. Soil Moist to damp soils. Pruning Prune in late winter/early spring. Uses Great as a foundation plant, specimen or hedge, can be used as a replacement for pyramidal yews. Good in groupings and mass plantings, perennial and shrub borders, can be used as a screen or hedge. An outstanding plant for the winter landscape. Soil Prefers moist, acidic soils. Protect from winter sun and wind in the north. Uses Great for grouping and for massing on large banks, in beds, and perennial and shrub borders. This is a good plant for woodland gardens or at the front of the mixed border. Its small size makes it perfect for smaller borders and beds. Features Fragrant white summer flowers attract butterflies. Bright red fall foliage. Deer resistant. Native. Uses Mass plantings; rock gardens; slope and bank plantings. 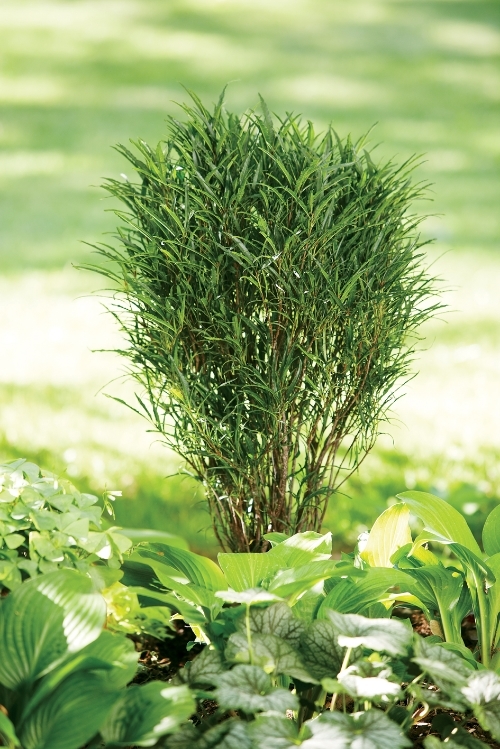 Features Soft-textured evergreen with colorful foliage. Spreading habit. Deer resistant. Drought tolerant. Soil Good in sandy, rocky soils. Pruning Prune to shape in early spring. Uses Gorgeous in the landscape as a specimen plant or in a container. Plant in the ground in fall if kept as a patio plant. Good in shrub borders and woodland gardens. Does best in filtered sun. Features Golden foliage is attractive all season. Light pink spring flowers. Orange red fall color. Deer resistant. Soil Prefers medium, well drained soils. Features Gold foliage. Fragrant. Deer-resistant. Pruning Generally not needed. Older plants may be thinned up to 25% in winter. Features Yellow flowers. Fragrant. Vine. Long bloomtime. Soil Adaptable to most soils. Pruning Seldom needed, but may be trimmed after flowering. Uses Great foliage stunner in the landscape. Good in groupings and mass planting, perennial and shrub borders. This is a very tough plant that is ideal for difficult sites. Features Coppery-orange foliage all season long. White flowers in early summer. Adaptable. Easy to grow. Native. Pruning Prune about a third of the branches to the ground in late winter. Uses Mixed borders, hedges, foundation plantings. Features Native. White flowers. Bronze-maroon foliage. Very hardy. Uses Great for a wide range of uses including narrow hedges or screens, accent specimen, patio planters, and combination planters. Good in perennial and shrub borders. Can be used to frame doors and pathways. Features Fernlike foliage turns yellow in fall. Ideal for containers and narrow beds. Do not eat the berries. Non-invasive. Deer resistant. Pruning May be trimmed in late fall. Uses Great as a shrub in the landscape or as a potted shrub on the patio. Good in groupings or masses, or perennial and shrub borders. Makes a nice specimen or screen. Tough enough for roadsides or naturalizing. Good in wet soils. Features Distinctive lacy foliage all season and soft pink early summer flowers. Season long color and texture. Fall fruit attracts birds. Deer resistant. Soil Prefers moist soils, but will adapt to dry ones. Pruning Prune after flowering. Prune hard as a young plant to develop a good habit. Uses This is an outstanding landscape plant! It is perfect for mass plantings or as part of the mixed border. Features Massive pink flowers bloom against the bright yellow foliage. Glowing orange spring foliage. Season long color. Deer resistant. Easy to grow. Features Evergreen. Dwarf. Yellow foliage. Soil Prefers deep, well drained soils. Pruning May be trimmed in early summer. Uses The tight, columnar habit makes this a great specimen or screen for narrow sites. Use as a bold accent plant in mixed borders. Features Narrow upright columnar habit is perfect for narrow sites as a specimen or screen. Little care is needed. Evergreen. Hardy, resists winter burn. Excellent landscape plant. Pruning Shear in early summer after spring growth has expanded. Uses Mixed borders, wildlife gardens, foundation plantings. Features White late spring flowers. Blue fall fruit. Deer-resistant. Native. Shiny foliage. Features White late spring flowers. Blue fall fall fruit. Deer-resistant. Native. Shiny foliage. Features Fragrant. White flowers. Compact. Deer-resistant. Uses Shrub borders, grouping, masses, specimen plants, and containers. Features Chartreuse foliage transforms to iridescent buttercream in late summer. Red spring flowers often rebloom. Deer resistant. Uses Use in shrub borders, grouping, masses, as a specimen or in containers (plant in ground in spring.) Very nice along walkways or other narrow sites. 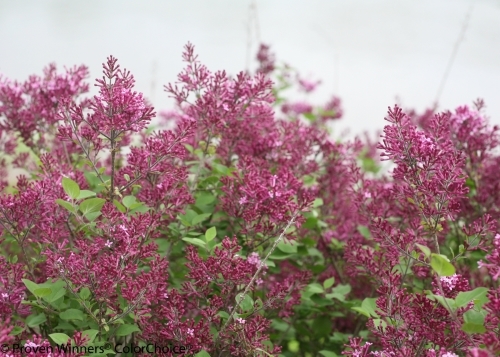 Features Pink spring flowers and dark purple foliage all season. Season-long color. Dwarf. Deer resistant. Features Pink spring flowers and green and white variegated foliage all season long. Great for mixed beds and borders. Season long color. Dwarf. Deer resistant.